Were Mizrachi Babies Stolen To Give To Ashkenazi Families In Israel? Remember these stories, Lela. You are growing here now, in America, but your roots are far away in the Middle Eastern desert. Don’t forget your roots. My mother is a born story teller. I was raised on tales that bordered on mythical. Stories of my aunts and grandparents being expelled from Libya with gold coins sewn into their underclothes to begin a new life. Stories of my mother being brought to door to door, to Christian, Muslim, and Jewish women to be nursed, because my Safta had fallen ill on the journey to Israel. And stories of my brown skin Sephardic cousins being saved at the last minute from being to handed to wealthy Ashkenazi mothers. Memory is a tricky thing and often the boundary between fantasy and reality is too blurry to determine. And yet, still we take wisdom where we can, drawing lessons from stories whose origins are always in question. Did my aunts really have to hide gold coins as they escaped from Libya? I’m not sure… but, my mother has always hidden away little bits of gold since… just in case. Was my mother really raised on multi-faith milk? I’m not sure… but she raised us with a feeling of kinship to other religions because of it. Was my cousin really in hidden in a back room with several other babies whose mothers had been told that their babies were dead? I’m not sure… but my mother has always made sure to find a distinguishing mark on our newborns the second they were born because of it. For my own part, I claimed the stories I liked as part of my roots, and rejected the ones I didn’t. The hidden bits of gold was charming, practical. The multi-faith breastmilk was inclusive, inspiring. But… the stolen babies story was ugly and terrifying. Accepting it would have meant accepting that my fellow Jews, those who had just escaped an atrocity beyond words, were capable of horrors I didn’t want to believe. So I rejected it. Stories like that of Zvi Amiri, who, despite the obvious difference in skin tone between himself and his parents, didn’t question his heritage until customers at the bank where he worked began mentioning how much he looked like a neighboring Tunisian family. Years later, when he found his biological family, they told him the hospital had declared him dead shortly after his birth. Or of Leah Aharoni who was told that one of her twin baby daughters had died in the hospital… only to discover documents years later attesting that her daughter had been moved from Tel Aviv and died at 3 years old. Or of Shlomi Hatuka whose grandparents refused to put their daughter up for adoption, only to have her allegedly abducted days later. The more I read, the more I realized that the mystery of Israel’s lost children is not just part of my roots, but one that is integral to the history of thousands of Middle Eastern Jews. 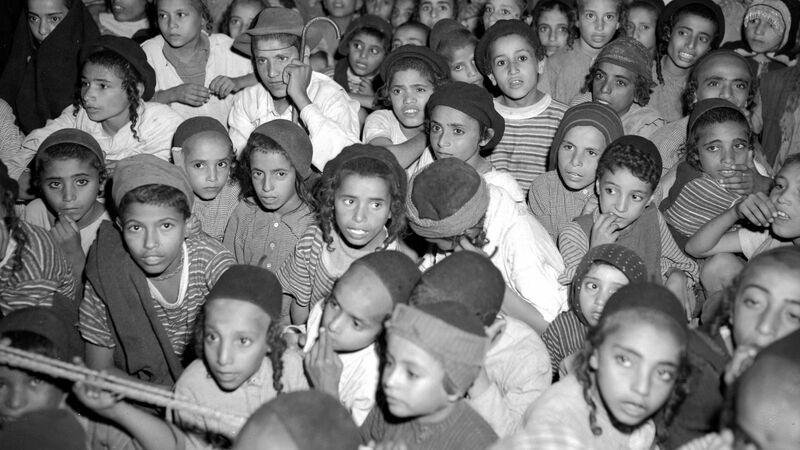 The issue became so well-known that it was termed The Yemenite Children Affair, due to the large number of Mizrachi babies, many of whom were Yemenite, who were unaccounted for. Most cases involved parents being informed by the hospital that their newborns had died, although they never received any reliable information to validate the news. Conditions were difficult in the late 40’s and early 50’s for new Mizrachi immigrants to Israel. Most were placed in large, overcrowded tents until more suitable housing could be found. Families with large amounts of children who had only recently escaped the horrors of pogroms and work camps, lived in close, cramped quarters with one another. Many babies legitimately did not survive the dire conditions. But there remain stories in which sufficient doubt exits about the whereabouts of the child. These ongoing allegations have resulted in three formal inquiries as to the fate of the missing children in Israel. None of them have found any confirmable date that the babies were stolen. Nevertheless, in December, 2017, the Israeli government opened up 200,000 previously classified documents from the state archives to attempt to show conclusively that no such abductions have taken place. Perhaps this should have been the end of it. But, for hundreds of Mizrachi families, the pain and questions continue to linger on. Are these stories true? Although we may never know for certain, there is no doubt that the stories will continue to be shared and re-shared amongst Mizrachi families, forming the roots of generations to come, wherever their lives are growing. I will remember the stories of my roots. I am growing here now, in America, but my roots are far away in the Middle Eastern desert. I won’t forget my roots.